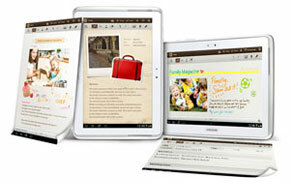 Samsung Galaxy Note GT-N8010 16GB Storage 10.1" Display Quad Core Tablet -White. Brand new Sealed Unit, Official Samsung UK Stock, 1 Year Warranty Direct With Samsung. 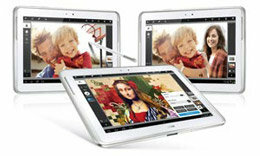 Simultaneously view and use multiple apps, browse the web and watch videos on a spacious 10.1-inch touchscreen. It's like using your PC at home. You don't have to interrupt entertainment or work when you need to do something else that's urgent. The S Pen is seamlessly integrated, so it's easy to move content from one screen to another. Sketch, take notes, and draw with incredible precision. The precise and pressure-sensitive S Pen is calibrated to write exactly what you want, so you can make ideas come to life just as you imagined them. It's a totally natural writing experience - just like using a real pen. Speakers in this system are produced from Bio Kelp which encapsulates the very essence of eco-aware technology. Using natural materials extracted from seaweed, the Bio kelp speaker is able to create higher resolution sound, extra depth of detail and cleaner, clearer vocals than conventional speaker materials. 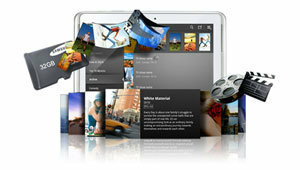 Sophisticated digital publishing lets you select and combine all kinds of multimedia content. You can choose from a selection of preloaded templates and pick the one that's best suited to whatever you need to express. The carefully-designed templates fit a range of purposes, including Note, Meeting Note, Diary, Magazine, Ideas Note, Travel and Recipe. Note-taking and creation is rich and easy, and you can create professional documents you will be proud to share. Your rough sketches are automatically converted to straight lines and perfect geometric shapes like circles and squares. Shape Match recognises what you're trying to draw and helps you to create it. When you write mathematical formulas with the S Pen, they become neat text. You can also use the Search function to find graphs and other visual representations that demonstrate the formula. Produce stunning original image artworks and edit your photos with a powerful creation suite. You can make your pictures perfect by using layering, blending, touch-ups, filters and more. View all your content on a large but portable display. It provides all the on-screen space you need to truly enjoy movies, games and other entertainment, work productively or be creative easily. A high-powered 1.4GHz Quad Core processor and 2GB of RAM make sure you enjoy spectacular gaming, seamless web browsing, fast user interface navigation and smooth multimedia playback. The Android 4.0 Ice Cream Sandwich operating system gives you faster navigation, better multitasking and a smoother user experience than ever before, as well as a range of new functionality. A large battery capacity makes sure you won't run out of power when you need it. Revel in mobile multimedia without restraint or delay with impressively fast transmission speeds that allows you to get your files so much quicker. Wi-Fi Channel Bonding boosts wireless data transmission rates by efficiently using two bonded channels instead of one so you can access web-based content such as movie downloads, music files and games in half the usual time. Wait less, enjoy sooner -- its as simple as that. There's a great selection of apps and games designed to make full use of the intuitive S Pen and its unique functionality. You can find them using S Suggest, which saves you time by recommending the perfect apps. Transfer contacts, multimedia and messages from previous devices with Easy Phone Sync. 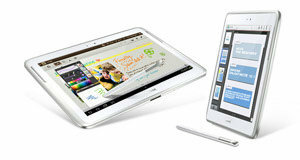 It's easy to make the switch from another manufacturer's device to Galaxy Note 10.1 with no hassle at all. Connect to tablets, laptops and TVs wirelessly to share multimedia and view your photos, videos and other multimedia on bigger screens. You can quickly and easily show all the family your holiday photos on the television. With Learning Hub, people of all ages can educate themselves with all kinds of study material, wherever they are. You can improve your knowledge, take tests and plan your education schedule. You can buy or rent a wide selection of great movies and TV shows with Video Hub. 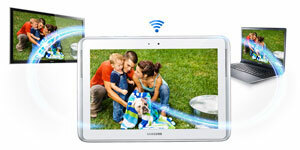 Samsung Galaxy Note 10.1 WiFi - tablet - Android 4.0 - 16 GB - 10.1"